We are a family run Indian and Pakistani restaurant based in Edinburgh. Roti was started by Mohammed Din and his Sons in the late 1990’s. The decision to open the restaurant was inspired by the mutual love for flavour and passion for traditional cooking methods. The head chef at Roti is Abdul Ghafoor who is a highly experienced chef and loves being ambitious in the kitchen, trying new flavours and creating truly mouth watering dishes. Our friendly team is managed by Sanna Mughal who shares our enthusiasm for authentic, delicious Indian and Pakistani cuisines. 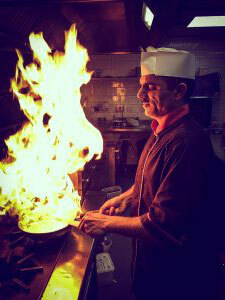 Abdul Ghafoor is the executive chef at Roti, he holds more than 20 years of restaurant and catering experience. Born and raised in Pakistan, his first professional position introduced him to the rewarding relationship between food and making people happy. It remains the foundation for what drives him today. Ghafoor has worked and trained at various restaurants and hotels in Pakistan where he honed in on his culinary skills learning from some of the country’s most respected chefs. His entrepreneurial spirit and desire to create unforgettable food led him to relocate to manchester working in award winning restaurants. He now wants to show the people of Scotland the true traditional food of Punjab. 7 days a week from 11.30am to 11.00pm.